The Interlocking Pavers are manufactured in a Modern Hydraulic Compression Machine and high precision steel moulds and rubber moulds under controlled conditions that produce pre cast high strength concrete units in different desired shapes, thickness, and colors. Available in 40 mm, 50 mm, 60 mm, 80 mm and 100 mm thicknesses in regular normal type as well as anti- skid finish rubber mould type pavers. We cater unmatched services and quality products. Pavers are available in zigzag pattern, Bi- arc, Tri- arc, Colorado, Moonstone, I-shaped paver, Tri- Hexa pattern, U- pavers etc. mainly available in grey, yellow and red, also multi-colored. Exceptional finish luster and strength, non- slippery, major cost saving and complete range of applications in exteriors and open spaces like foot paths, side- ways, parking, open areas, drive- ways, car ramps, promenades, corridors, verandas etc. Our firm has gained immense recognition in manufacturing and exporting superior quality Concrete Interlocking Pavers. Manufactured from premium quality raw materials, our range of concrete pavers is in a high demand in the market. It enhances the decor of a building and is also very durable, easy to clean, install and replace. We offer a wide range of Concrete Interlocking Pavers which comes in a variety of sizes, shapes, dimensions and in a plethora of colors. PAVERS ARE Designed by using premium quality raw materials and advanced technology, our range of interlocking pavers is in a high demand. We offer world class quality interlocking pavers to our clients that are widely used in construction of a building. We offer this slab paver in various sizes, dimensions and design and that too at market leading prices. These Cement Concrete Interlocking Pavers are highly durable, easy to clean and install. Our dexterous and meticulous professionals use high grade raw materials which are procured from reliable and trusted vendors of the industry. These decorative pavers are used for both commercial as well as residential buildings. These are available in various attractive design, pattern, color and dimensions and that too at very competitive prices. Known for its high durability, easy installation and low maintenance features; our range of Cement Interlocking Pavers is in a high demand. With the support of our adroit professionals, we manufacture and Designed with utmost precision. In order to ensure the quality of our products, these are quality tested on various parameters by our quality controllers. Available at market leading prices, these pavers are known for their easy installation, durability and high tensile strength. 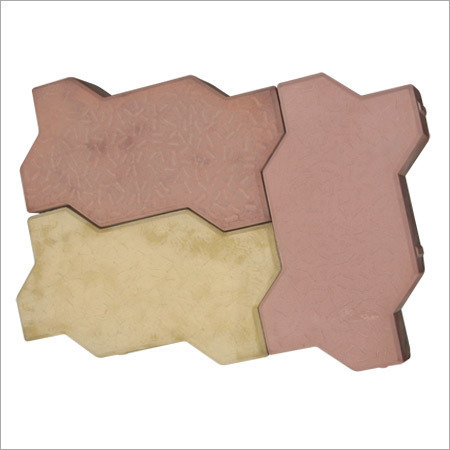 This Concrete Interlocking Paver is available in different attractive sizes, colors and dimensions from which our clients can select as per their needs and requirement.